UMKC faces myriad challenges in providing the facilities and environment that optimally support the development of innovative creative endeavors, educational experiences and engagement with the community. Funds are necessary to maintain existing buildings, restore and renovate existing campus space and build new facilities. The creation of knowledge is what keeps society moving forward. Philanthropic contributions provide necessary support for novel or promising research that has potential for improving quality of life and human experience. With the ever-increasing speed of technological innovations, costs incurred by universities — as they race to keep up with technology — is significant. The perpetual information explosion demands continually expanded course offerings, frequent textbook revisions and the latest in educational resources. At the UMKC School of Medicine, faculty researcher Peter Koulen has found an innovative way to diagnose the early stages of Alzheimer’s disease – with an eye exam. A more rapid and conclusive diagnosis is possible with the test Koulen has developed at the School of Medicine’s Vision Research Center, where he has served as director of basic research since 2009. Koulen’s work received a patent in January and has been attracting attention since. Read more. 1Data is a collaborative human and animal health project by researchers at Kansas State University and UMKC that is designed to help save lives and improve the quality of life for humans and animals. UMKC’s Gerald Wyckoff, professor of molecular biology and biochemistry, is directing the team working to fully simulate traditional research with animal models — decreasing the need for animal models while also identifying congruencies between human and animal diseases. This helps enhance the regulatory process and accelerates the development of drugs and medical technology for people and animals. Read more. 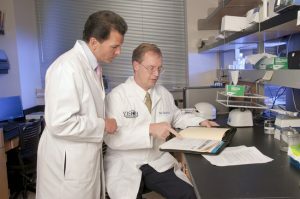 A new initiative led by UMKC’s Institute for Human Development is seeking to enhance the partnership among medical professionals, adults with intellectual/developmental disabilities (IDD), family members and disability providers that supports informed choice and supported decision making (SDM) practices on health care decisions. The initiative, Charting the LifeCourse: Health Care Preferences and SDM for People with IDD, exemplifies UMKC’s goals of both promoting full inclusion by embracing diversity and promoting research and economic development. Read more. The behavior lab, the only public space on the first level of the Henry W. Bloch School of Management, is the first at any regional business school. High-resolution cameras in three interview rooms will enable researchers to record body language and facial expression. The behavior labs will be used largely by the Research Engagement Program, which is currently using vacant classrooms and conference rooms to conduct studies. Make a gift that touches hundreds of students and faculty by investing in the School of Nursing’s cutting-edge programs. One of the biggest needs is updating outdated and worn out technology. The school is especially dedicated to regular improvements within their standardized patient laboratory and the simulation laboratory. The overall technology upgrades are costly, but also an essential ingredient for the school to remain on the front-line of health care changes. Renovating and expanding UMKC’s primary biology and chemistry teaching laboratories enhances our ability to offer outstanding research and academic degree programs in modern sciences at both the undergraduate and graduate level. 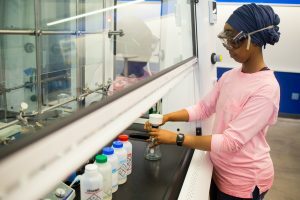 Upon completion of the entire project — anticipated by July 2018 — UMKC students and faculty will enjoy state-of-the-art spaces that meet current laboratory standards and modern technology requirements, along with teaching areas conducive to a collaborative learning environment. The College of Arts and Sciences will renovate existing studios and purchase new equipment that will enable students to use a wide range of computer-based images, text, audio and video technologies. In addition to enhancing community partnerships, the new studio will contribute to a more developed and dynamic arts culture on campus. Modern facilities and updated technology are crucial factors in recruiting and retaining top students and faculty in the Communications Studies Department at UMKC. UMKC Libraries have an amazing collection of valuable resources that aid students and patrons in their research. Currently, the libraries are working to digitize their special collections so they can be utilized more conveniently by a wider audience in the modern world. Having a digital version of the special collections helps the libraries expand their reach and benefits all that take advantage of these additional resources. Musical Bridges provides exceptional young musicians with the intensive, one-on-one instruction and performance experience necessary to prepare for auditions into selective university programs such as the UMKC Conservatory of Music and Dance. By focusing on underrepresented populations, Musical Bridges aims to give students with great artistic potential the opportunity to succeed in the performing arts. The UMKC School of Dentistry student dental clinic is dedicated to oral health care education and service to the community. The clinic is a learning laboratory for students to gain clinical experience, ask questions, learn and consult alongside faculty, develop critical problem-solving skills and prepare for a profession in oral health care. It serves as a vital community outreach by providing low-cost dental treatments to the public. The UMKC School of Education’s Institute for Urban Education (IUE) is a 4-year teacher education program — the first undergraduate program of its kind in the United States — that leads to a Bachelor of Arts degree in elementary or middle school education. The program prepares teachers for success in urban classrooms by also introducing issues of social justice and multicultural learning styles. IUE students receive scholarships and, in exchange, commit to teach in a Kansas City area urban partner district for at least four years following graduation.